In difficult times, it is comforting to know that all of the funeral arrangements are being handled with the utmost dignity and understanding by fully trained and qualified personnel. Ninness Funeral Home has experienced, qualified staff available 24 hours a day, seven days a week, to offer assistance to families and individuals during one of the most difficult times. We very much value the many friendships we have formed with families throughout Porirua, Tawa and surrounding areas over our decades of service to the community. 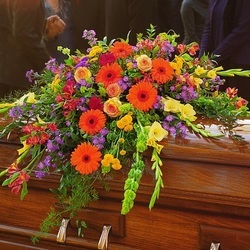 Once the preparations have been completed, there is the option of having the casket brought home, to another venue or your loved one may remain at our funeral home. Please phone to confirm a time for viewing. This is especially important for after-hours visits so that our funeral home team can be here to warmly welcome you. There is no ‘correct’ set of clothes to use. You may choose a suit, dress, casual clothing, nightwear, or whatever else feels right. Glasses and dentures should be supplied if they are usually worn. You are welcome to dress or assist with dressing. A decision also needs to be made about what is to happen to any jewellery worn by your loved one. We may lightly apply special cosmetics to restore a natural skin tone. Lipstick and perfume usually worn can be used. You are welcome to give advice and participate with both cosmetising and hairstyling. A recent photo or a description is helpful. We have a purpose built, air conditioned chapel on site which seats 100 people and has a comprehensive sound system. There is a substantial adjoining lounge area to accommodate larger funeral services. Our celebrants come from a variety of backgrounds and we will work with you to ensure you get the right funeral celebrant for your farewell. You are, of course, free to select any Funeral Celebrant of your choice. They all receive a set fee which is usually paid by the funeral director on the day. We are more than happy to suggest an organist if you would like to have one, however if you are using a church for the service they usually have an organist that they prefer to use. We have a system that plays CD music in our chapel and a portable system for other venues. We also have a range of music appropriate for funerals - so please ask your funeral director if you are after a special track of music. We may well just have it in our music library. Many families like to remember how their loved one's life was celebrated. Having a service sheet can help with this and it will also enable people to participate in the Service. Some families prefer to produce their own, but at Ninness Funeral Home we can prepare them for you. We do the design, layout and printing of the service sheets, however we require at least 12 hours notice to produce them. Service sheets can include colour or black and white photographs on the front, as well as on the back. You can also include your chosen hymns, readings, poems or other special tributes. We at Ninness like to show a proof of the service sheet to make sure that you are happy with what is being printed and the quality of the paper being used..
We provide a memorial book that relatives and friends, who attend the service, can write their name in. If you would like one please let your funeral director know. We can arrange the main flowers for the casket from the family or any other family tributes. We have a selection book to choose from or you can look at our flower selection here. The florist will also provide committal petals or flower heads if they are to be used during the service or committal. You are also more than welcome to use a florist of your own choice. If you would like donations in lieu of flowers to a particular organisation this can be advised in the main funeral notice. We provide the donation box and an accompanying sign at the service. After the funeral we forward the donations to the organisation selected and they will acknowledge these donations to the family. With family and friends away from home or overseas the option of videoing or audio recording the funeral can be arranged. Please talk with your funeral director about availability and costs. Cars can be hired to take the family from home to the funeral venue and later to the committal and/or back home afterwards. Buses can also be hired to take the congregation from the venue to the cemetery and then back again. Details needed for the registered copy of the death certificate are given to the funeral director at the initial arrangement interview. This information, along with the doctor’s findings, are sent to the Registry Office. We usually have the death certificate back to our office within a week. It is then sent out with the final account. Please let your funeral director know if you need the certificate earlier or urgently. The family may arrive at the venue for the funeral service a few minutes before the service starts, or may prefer to come earlier in order to greet other family and friends as they arrive. Your funeral director will greet you and show you to your allocated seating. It is usual that the family sits in the front rows. Seating will be reserved for the immediate family to ensure that they are seated together. When driving in a funeral procession with the hearse, please have your lights on ‘park’. Six people are usually required to carry the casket but four can also be an option. You'll know from your family and friends who will be best suited to be pallbearers. Please have the pallbearers meet with the funeral director 10 minutes prior to the service beginning. The casket may be placed in the venue before people start arriving or can be carried in to start the service with processional music. As the casket is carried in or out the immediate family usually follows behind. We can arrange for catering and servers following the service in our reception foyer or other venue of your choice. There is a select menu of savouries, club sandwiches and sweet slices. All tea, coffee, milk and juice is supplied. If you would like a different menu please just advise your funeral director. We can arrange personalised acknowledgement cards using your own choice of photo and wording. All cards come with envelopes. Acknowledgment notices in the newspaper can also be arranged by your funeral director. At the time of the initial interview, the family will be given a full cost estimate of the goods and services that have been requested. This will need to be signed – giving Ninness Funeral Home permission to proceed with the arrangements. We usually send the final account, statement and death certificate a week after the service, giving a further two weeks to pay the final amount. We can also discuss alternative payment options with you should this be required. Please talk to your funeral director about this.